LOCATION.--Lat 41°18'33", long 74°47'43" referenced to North American Datum of 1983, Dingman Township, Pike County, PA, Hydrologic Unit 02040104, on right bank 1,500 ft upstream from toll bridge (on U.S. Route 206) between Montague, NJ and Milford, PA, 0.8 mi downstream from Sawkill Creek, and at river mile 246.3. PERIOD OF RECORD.--March 1936 to September 1939 (gage heights only, published as "at Milford, PA"). October 1939 to current year. GAGE.--Water-stage recorder with telemetry. Datum of gage is 369.93 ft above NGVD of 1929. 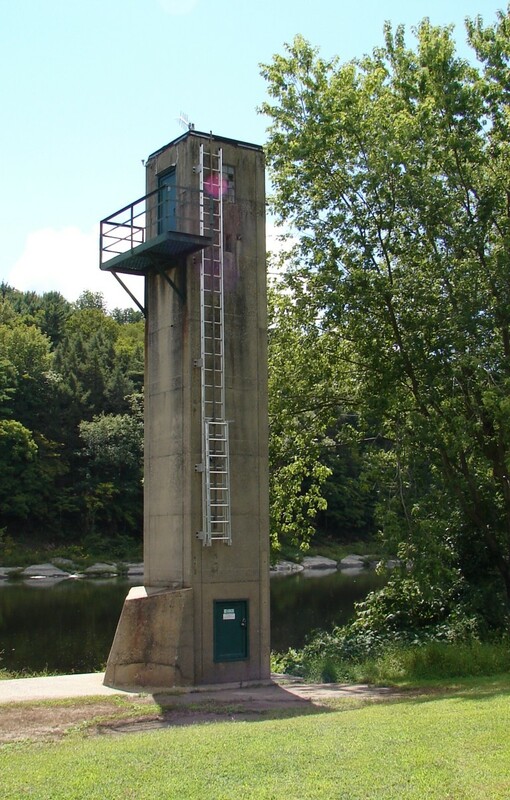 Prior to Feb 9, 1940, non-recording gage on upstream side of left span of subsequently dismantled bridge at present site at datum 70 ft lower. REMARKS.--Records good, except for estimated discharges, which are fair. Diurnal fluctuation at medium and low flow caused by hydroelectric plants on tributary streams. Flow regulated by Lake Wallenpaupack, Cliff Lake, and by Pepacton, Cannonsville, Swinging Bridge, Toronto, and Neversink Reservoirs. Discharges above 105,000 ft3/s from rating curve extension on basis of flood-routing study. EXTREMES FOR PERIOD OF RECORD.--Maximum discharge, 250,000 ft3/s, from rating curve extended above 105,000 ft3/s on basis of flood-routing study, Aug 19, 1955, gage height, 35.15 ft; minimum discharge, 382 ft3/s, Aug 24, 1954. EXTREMES OUTSIDE PERIOD OF RECORD.--Flood of Oct 10, 1903 reached a stage of 31.1 ft (from high-water mark), discharge, 217,000 ft3/s. PERIOD OF RECORD.--Water years 1956-73, 1976-78, 1991 to August 2009 (discontinued). REMARKS.--Cooperative Network Site Descriptor: Delaware River Main Stem, New Jersey Department of Environmental Protection Watershed Management Area 1. The samples on Mar 10 and May 27 included volatile organic compound and filtered pesticide assessments, respectively. COOPERATION.--Physical measurements and samples for laboratory analyses were provided by personnel of the NJ Department of Environmental Protection. Determinations of dissolved ammonia, dissolved orthophosphate, and suspended residue were performed by the NJ Department of Health and Senior Services, Environmental and Chemical Laboratory. National Weather Service flood stage for this gage is 25 ft.